Houston, TX (April 3, 2015) Vaughn Gittin Jr proclaims himself as a “professional fun-haver” – if you look it up, there’s probably a bearded avatar there next to the description. That said, for Gumout Performance Additives, the fun was too much not to return for another year. In 2015, Gumout will increase its presence on Gittin’s Ford Mustang RTR as it looks for more wins and a championship in the Formula Drift Series presented by GoPro (FD). “Last year was a blast,” quipped Gittin Jr. laughing. “We had a ton of fun with the Gumout crew. We traveled the world, won a couple of events, and we made some friends and believers of their products. In addition to Gumout, Gittin’s RTR will shine on and off the track thanks to Black Magic and it’s suite of car care products. If you’ve been to a Formula Drift event, you know it’s rare to see a dirty set of wheels or tires in the parking lot. “I am pumped to bring Black Magic on board as well. They’re #1 in tire shine for a reason and my team is pumped at how much easier it is to clean the brake dust and rubber off of our wheels using the Black Magic wheel cleaners. Gumout and Black Magic are also adding the Formula Drift presented by GoPro series to their back pocket with a sponsorship in 2015. The success of combining the two programs last year led to a formal marriage this year. 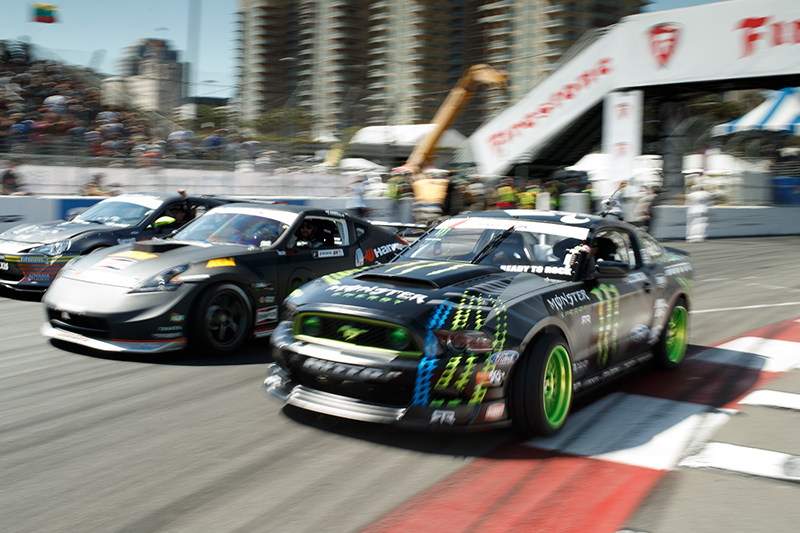 Vaughn Gittin Jr will open the FD season in Long Beach, California on April 10th with a plan simply to win and podium – as often as possible. In addition to a new year of Formula Drift, Gumout will launch their “You Get My Drift” Sweepstakes at the same time. A lucky winner will take home a brand new custom 2015 Ford Mustang RTR. For information on how to enter to win, go to yougetmydrift.com for all the details. About Gumout: Since 1945, Gumout has been America’s trusted performance additives brand – they have earned this trust by providing high quality products that consumers need to get the most out of every mile. Gumout products have been proven in the lab, on the street and on the track using cutting edge technology that maximizes performance in any type of vehicle.